As in-conference play heats up, the Bellevue College men’s basketball team has continued fighting tooth-and-nail for a top four spot in the North Region. With a 1-2 record coming into the week, there was work for them to do in a home game against struggling Shoreline. From the get-go, Bellevue was motivated as they powered ahead of Shoreline. There was no point at which Shoreline was ahead, up until the five-minute mark in the first half when Shoreline lead 31-30. That was as close as the game would get, as the Bulldogs would never be in that situation again after the 93-80 victory. Five players put up double digits in points, with Kai Warren leading the charge at 18. Emanual Siale, Curtis Walker, Andrew Shaw and TJ Jlan followed with 14, 12, 11 and 10 points respectively. Walker led the team with 10 rebounds, and Jlan put up a team-high of 10 assists. Nine of Bellevue’s 13 assists came out of the reserves, with Malik Sanchez having three of his own. Bellevue also out-blocked Shoreline 11-1 with Siale and Warren blocking four and three shots respectively. 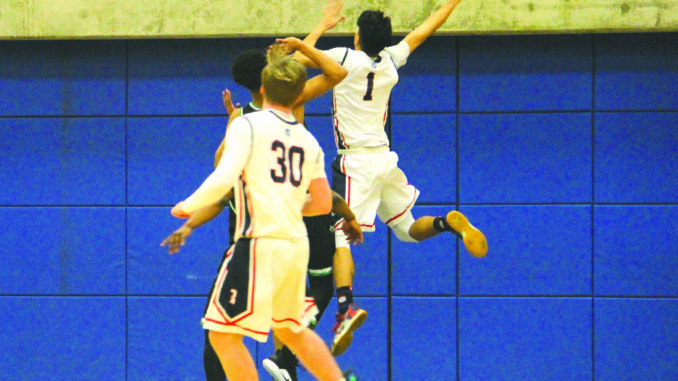 There wasn’t a statistic where Shoreline managed to substantially outperform Bellevue, as the Bulldogs also bested them in field goal percentage, shooting 40.4 percent to Shoreline’s 42.5. They also shot an impressive 73 percent from the free throw line. Watson was by far the most impressive, making 10 of his 11 free throws. Riding high into Wednesday’s game against Edmonds, Bellevue’s efforts weren’t quite as fruitful. After starting the game 2-12, the Bulldogs fought and held a brief first-half lead at 27-25. However, an eight-point halftime lead was more than enough for Edmonds to close the door on Bellevue in a narrow 79-83 loss. Only fielding nine players, four put up double digit points once again. Warren led the team with 18, while Walker and Sale tied at 16. Sanchez started this game and ended up with 14, making 64 of the team’s 79 points. Walker grabbed eight rebounds and Sanchez led the team with five assists. Despite the loss, Bellevue out-performed Edmonds in blocks and steals respectively. The issue is blatant on paper, with Bellevue going 1-17 from the three-point line. This makes a 5.9 percentage from deep, as opposed to the team average of 35. This very well could have been the deciding factor; Bellevue once again found huge success at the free throw line. Shooting 16-20 as a team, Sanchez went 6-6, Warren went 5-6 and Austin Wilhonen made all three of his. A close loss sets Bellevue at 2-3 in-conference this season. This is currently good for fourth in the North Region, but there’s no doubt the Bulldogs want and deserve a higher standing. Their chance to prove themselves will come early, as Bellevue has matches against Everett and Peninsula coming up, which stand as two of the three teams ahead of them in the standings.